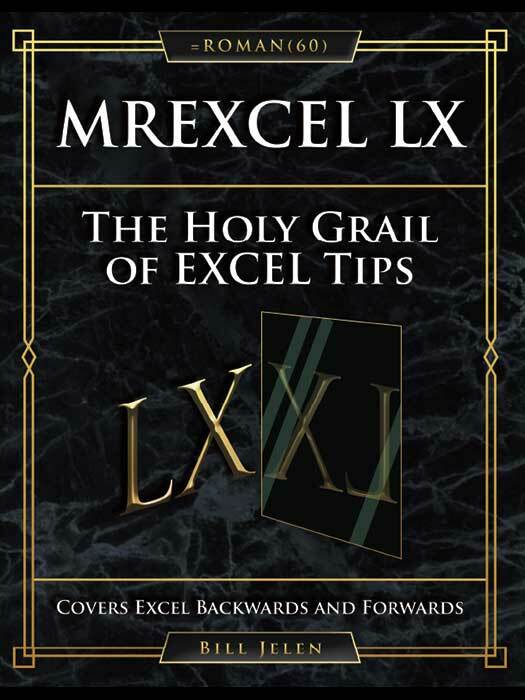 All of MrExcel's Favorite Excel Tips in this third edition. This a PDF e-book. I keep a spreadsheet that lists the books I‘ve authored. A few years ago I realized I would soon be writing book #40 and that the =ROMAN(40) is XL. Get it? XL sounds like “Excel”? Because of this joke, the MrExcel XL book was born. It became a staple at my live Power Excel seminars. For this updated third edition, I am going with Excel 60 (or, in Roman numbers, LX, which is XL backwards! )This is the book I use in my live Power Excel seminars. This third edition is updated for features introduced in 2018 & 2019 such as Geography Data Types, Stock Quotes, Artificial Intelligence, and the new Dynamic Arrays such as SORT, SORTBY, FILTER, and UNIQUE. There are also new tips that I’ve learned in the last two years.